Expectations for women in the 1930s and early 1940s were to marry and raise a family. To be relegated to spinsterhood was to be pitied and sometimes scorned. With the arrival of WWII, there was a gradual acceptance of women holding a career, albeit a “proper” career such as teaching, nursing, and secretarial. In literature, a few authors at the time pushed the envelope by creating female sleuths. Nancy Drew and Miss Marple being two of the most famous. Let me introduce you to one of the less well-known created by Stuart Palmer, reporter turned novelist turned screenwriter. 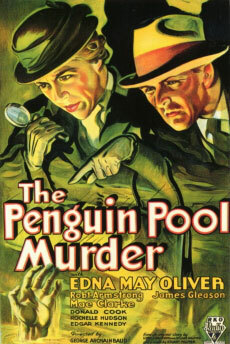 As with most amateur sleuths, school teacher Hildegarde Withers was thrust into the role when she stumbled on a body floating in the penguin tank at the New York Aquarium where she had taken her class. In addition to appearing in fourteen full length novels, Miss Withers shows up in countless short stories published in “Mystery” magazine, a periodical sold exclusively at Woolworths stores. In addition, Palmer successfully partners with author Craig Rice to pair Miss Withers with Rice’s character John J. Malone. There were several screen adaptations to the books with actress Edna May Oliver being the definitive Miss Withers.